6sqft’s series “My sqft” checks out the homes of New Yorkers across all the boroughs. 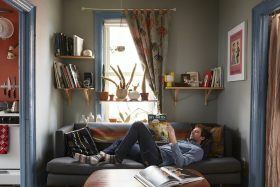 Our latest interior adventure brings us to the Greenpoint apartment of photographer Brett Wood. Want to see your home featured here? Get in touch! After studying photography in Massachusetts, Brett Wood moved to New York in 2001. At the time, all he knew is that he wanted to be close to the artists he admired, but nearly two decades later, he’s made a home for himself in Brooklyn and a career that sends him around the world. Though he’s usually capturing other New Yorkers’ home for 6sqft, Brett has now stepped out from the behind the lens to show off his own Greenpoint pad. A mix of earthy colors and textiles, eclectic finds from his travels, and an aesthetic that he endearingly describes as “cool grandad,” Brett’s home is certainly the making of someone with an eye for style.